A golfer’s dream come true! Play a round of golf at the fabulous Kangaroo Valley Golf Resort and stay in a villa with views to die for. Valley Vista is positioned above the tee at the 8th hole, high up on the course with uninterrupted views towards Upper River and the escarpment way over on the other side of the Valley. While this well appointed 3 bedroom villa can accommodate up to 8 guests it would also be perfect for just one couple or a family of 4, and you wouldn’t even need to be keen on golf!! There are 2 queen bedrooms, one on the mezzanine floor with an ensuite bathroom and the other on the main level beside a 3rd bedroom with twin singles and the main bathroom. One of the two seater sofas in the loungeroom doubles as a 5th bed when required. You are a short stroll to the inground pool, tennis courts, beach volleyball court and giant chess set. What more could you ask for? This property is not to be used for commercial purposes without the express permission of the property manager. I would recommend this home for people to stay as we enjoyed staying at this home very much. The place is very quiet, private and beautiful. The house is very clean. All quipment inside the house work. Love the kangaroos around the house. Love the sunrise and sunset views. Thank you so much Blay. I'm so pleased you and your family enjoyed your stay. It was a pleasure to have you and we would welcome you back again any time to enjoy all Valley Vista has to offer. The visiting wildlife and those sensational views are very special. 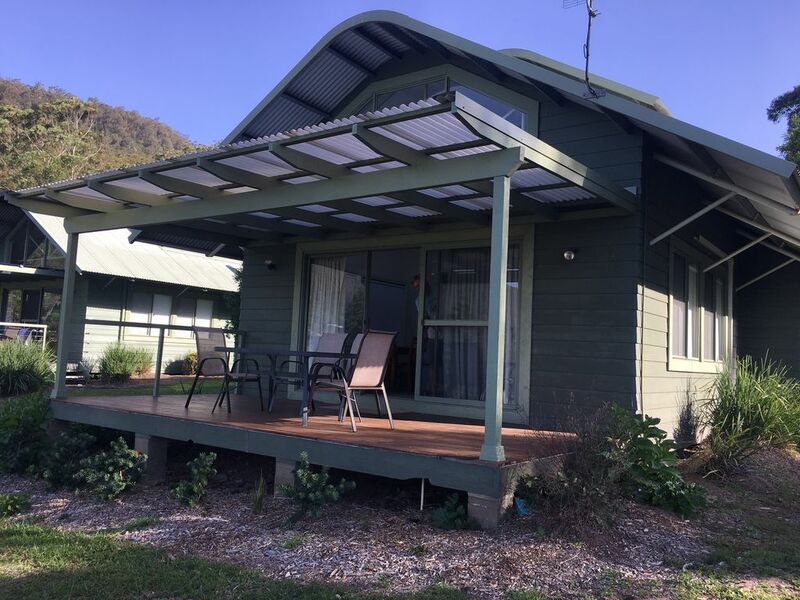 We recently stayed at Valley Vista over the easter weekend and enjoyed the stay. After the last review posted for the property on Stayz (albeit 2014), I must admit we were a bit apprehensive from the 2014 low rating rating, but it turned out much nicer and reasonably well maintained. Oven, fridge and amenities look to have been upgraded recently and were in good working condition. Best part of this stay was the great vista and view across the picturesque golf course and mountains in the distance. Great sunrises over the mists and sunsets. So overall a nice property. Great view, so much potential but sadly a bit let down. Very worn carpets, fridge did not work properly, froze our eggs! Oven burnt everything, ill equipped kitchen. Villa needs a makeover, a bbq and a dishwasher. I have stayed at another cabin at the resort which was much nicer, and well equipped. I would not go back again in the present condition. Nice people that managed property, prompt, and it was basically clean, but infested with ants. Owners really need to do something. The owners immediately replaced the fridge and stove once advised of these issues. All in good working order again now.